We are happy to announce our v0.9 release for Servicebot, an open-sourcesubscription management platform. This article will show you the latest additions to the platform and how to get the most value out of your Servicebot. 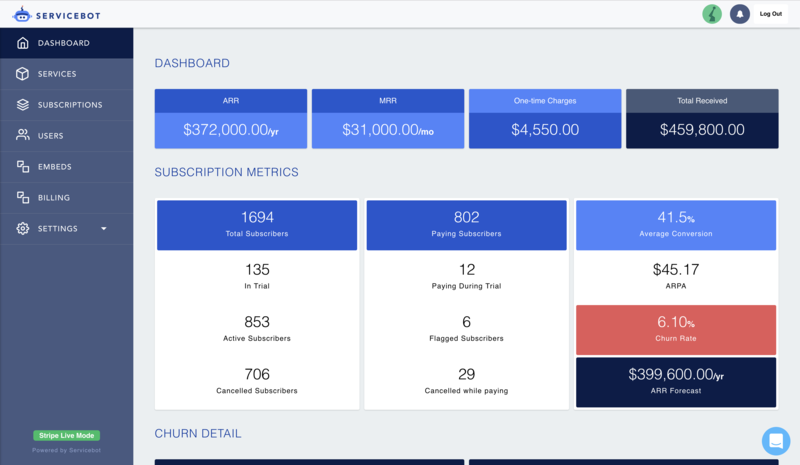 Since we started Servicebot last year, our goal has been to create an open-source platform that takes a service-oriented approach to subscription management. This approach allows for complete control over the different steps of the subscription lifecycle. In this release, we have finished our custom payment scheduler as well as made major changes to the UI and the internals of Servicebot. For full release notes, check out our GitHub. Since we added pluginbot to Servicebot back in September of 2017, we have slowly been migrating functionality from a monolithic architecture into a more service-oriented plugin architecture. We plan on eventually migrating all the code from the monolith to plugins, as well as allowing the plugin system to be controlled from the front-end, as commonly seen in CMS like Wordpress or Drupal. In this release we added a file manager plugin, which we are using in production to push uploads such as logos or user avatars to S3 instead of the filesystem. There is now an option to send event data to integration points such as Jenkins, Zapier, or your own applications. These events will allow you to tap into the service lifecycle of Servicebot. A SaaS business has a free trial registration form on their website which, when requested, will create an account in their app and attach an access token to the response so they can be logged in. Using Servicebot to manage their subscriptions, they can easily have a webhook connect to their app, or build automation service such as Jenkins. This will allow for service lifecycle events, in this case a “requested” event which triggers whenever a new subscription is requested. Going further, the “cancellation” and “trial expiration” events can trigger app access to be restricted until they add a funding source. 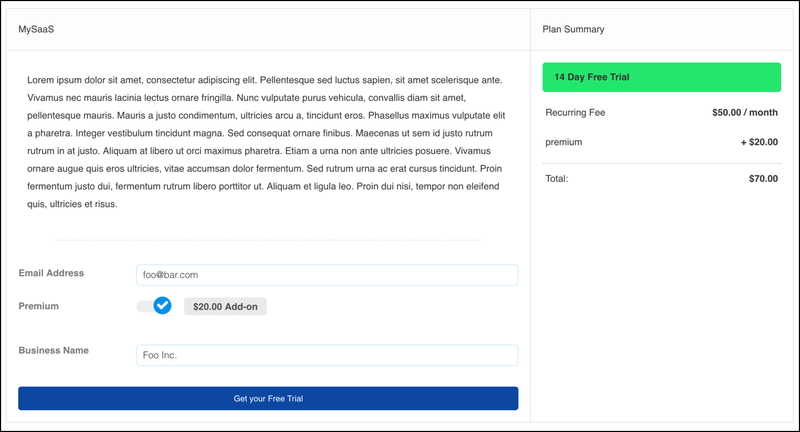 With this latest release we added a new feature for allowing much more customizable payment plans. 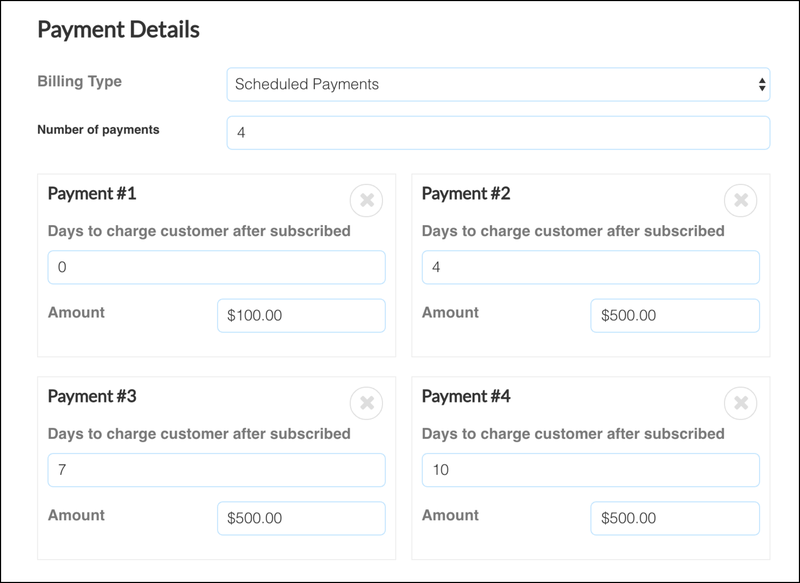 Here’s how it works — First, you set the billing type of a service to be “scheduled payments,” then you can set the number of payments desired, when each payment should occur, and the amount each payment should be. There are two main points to building this feature: The ability to split up a one-time payment into multiple payments, and the ability to have a more flexible payment structure. Let’s say you are a business that provides a $6,000 consulting service over three months. The obvious choice would be to split up that payment into a monthly $2,000 payment over three months. But with Servicebot, you can tweak how much each payment should be. An easier sell to a potential customer would be making that first payment at $1000, giving them a chance to “try out” your service for a month before committing to the more expensive second and third month payments of $2,500. There are three major UI changes in the version 0.9 release. Each change was developed based on feedback and analytics. We improved the way customers interact with the request forms to be more embeddable and more in line with how an invoice looks, as well as making the request form easy to embed in any existing site for a seamless customer experience. Our initial administrator dashboard page was very simple without any real data calculations. In our v0.9 release, we have added a whole new set of analytical calculations and designed an intuitive dashboard page to view this data. Charts are also included. This has been a major change in the v0.9 release, however, there are still more changes we would like to make to the dashboard for future releases. Based on our hosted solution usage, we realized that most people didn’t change the initial black theme that Servicebot came with. Since the August 2017 release, the theme has been customizable using the system options on the system settings page. To make this change more apparent, we have added a new blue colored theme that comes with some usage guides. For example, the dashboard will walk admins through a three step process of setting up their Servicebot. We are looking to develop more pre-defined themes, which admins can choose without manually selecting system colors. Our goal is to make it easy for businesses to sell subscriptions to customers through our open-source automation platform.